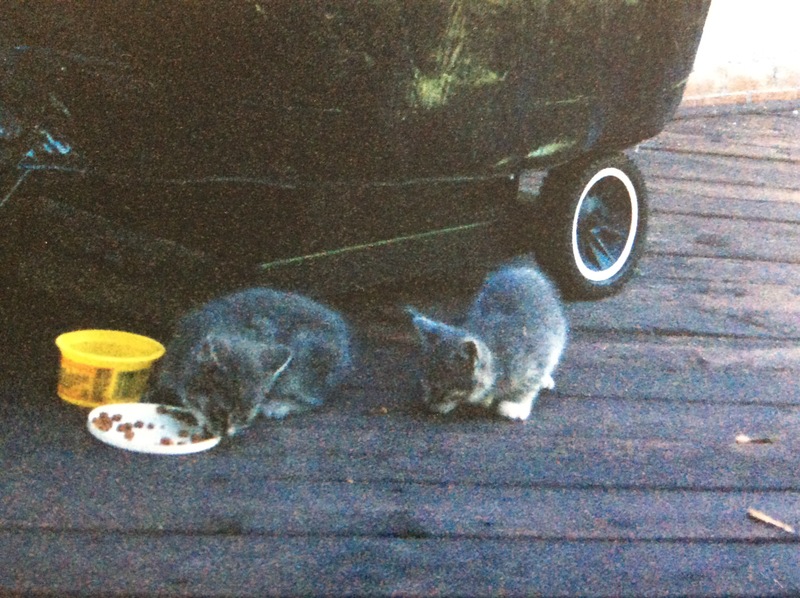 One summer two little tiny grey kittens appeared on my back deck. I think their mama had had them under there and felt they were big enough to be on their own. I estimated they were around 8 weeks old. I wanted to keep them but my husband was not in favour of allowing them inside. I called the Humane Society but they said they already had too many cats and would not help. 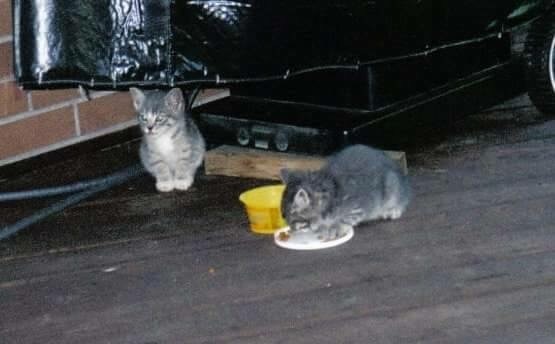 I fed them on the deck every day and they made themselves at home. One had little white feet so she was named “Mittens”. The other one we called “Angel”. They were very skiddish and wouldn’t let us touch them but they would scurry and play around in the yard entertaining us all summer with their cute kitten ways. We called it the “summer of the kittens”. When the colder weather came we didn’t see them for a while. One day Angel was curled up in the sun on the back deck. Another time we saw one of them run right up to the top of our huge tree. After that we didn’t see them again. I wanted to believe someone took them in but they were very wild and when I saw them that winter climbing the tree, I realized they were just going to be homeless. I do! I wish we could have kept them. They are so cute! I love this picture of them! We took so many pictures of them but most were on my old camera. My daughter sent me these. I even got a video of the one climbing really high up the tree. how sweet! 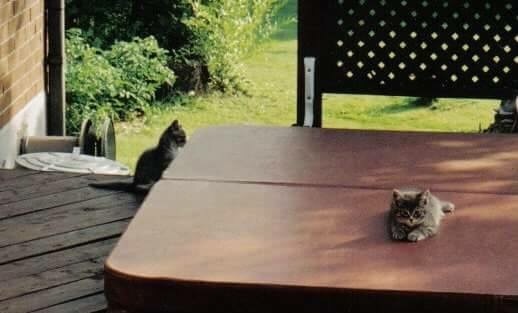 the one on the table is so cute! I have four rescues. The oldest were found at four weeks old. No food. No water. They were litter box trained. Fourteen years later, they are still here. With a six and five year old. We have an outdoor stray who’s about three. He has a house with a perch to talk to the inside cats through a window. Plus he gets hand warmers and a blanket when winter comes. That’s wonderful. I’d have a houseful too if I had my way. I do have a dog though. We had a black lab at one time. He was ok with the cats. The tom cat and him were buds. The girls he didn’t care for. I once found a tiny kitten on the street in the rain, mewing piteously. I brought her into my house, and begged my mother (who used to be staunchly against pets in the house) to let me keep her. My mother agreed reluctantly. Toulouse (or Tooley, as I called her affectionately) became everyone’s favorite. She was a lovely, somewhat fastidious white kitten with a small black-gray mark on her forehead. Her eyes were sea-green. She was beautiful. I will write a blog-post about her sometime soon. Thanks for sharing your lovely story about the kittens! We brought home kittens as kids too. My mother was not an animal lover but we did keep a couple. One was jet back and we named her Midnight. The other one was white and we named her “Fluffy”. My husband and I did have a cat when we first got married. Her name was Cookie. I think we still had our other dog when Angel and Mittens came along. This happened a few years ago so I’m sure they had more kittens and carried on the legacy. Great photos of your kittens. It doesn’t take long for us to form a bond and remember them as family friends even years later. The southern village I left to return to the desert this past spring had a very large population of feral cats. Some of them had very regular scavenger/hunting routes they followed every day and the people on my street all knew of them, but never did any of us know them..they would no sooner have approached us than eat cat food, and vanished if we took one step near. These were tiny kittens so would play close by but not close enough to touch.